ADDRESS: 5431 DeFoors Ferry Road, Tallahassee, FL 32308. Thomasville Road past Kerry Forest and Library, Right on Lenox Mill, Second Left on DeFoors Ferry Road. SQUARE FEET: 2694 sq. ft.
OTHER: Spacious four Bedroom/Three and one-half Bath family home with great schools. Close to Leon County Library, gyms, Walmart, restaurants, Bradfordville and more! Wood floors in center of house. Summer 2015: brand new carpet in all bedrooms and hallway; fresh new interior paint; new vinyl in inside laundry. Newer irrigation 2013. Newer HVAC in 2010. Newer roof and gas water heater 2007. Vaulted ceiling in the great room, master bedroom, front and back bedrooms. Greatroom had brick gas fireplace. Exit from greatroom to screened porch and private backyard. Master and back bedroom open to screened porch. Kitchen has center cook island, breakfast nook open to screened porch, desk and step-in pantry. Termite Bond with Terminex. 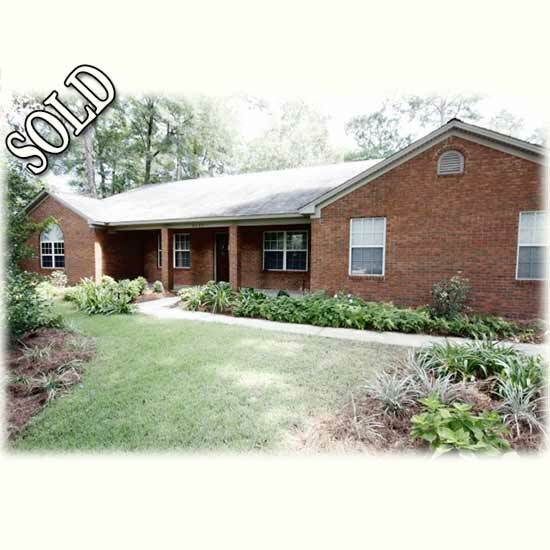 Beautiful gardens in front yard and mature azaleas in private backyard. About 1/3 acre.